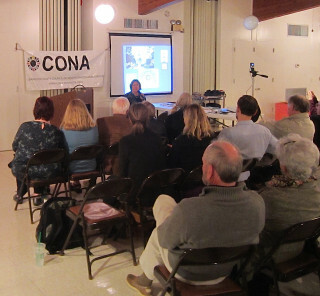 On Monday, June 13, at 7 p.m., the Sarasota County Council of Neighborhood Associations (CONA) will host a forum for candidates seeking to represent Districts 1, 3 and 5 on the County Commission, CONA has announced. All registered voters are able to cast ballots for candidates in each of those races, a news release points out. The forum will be free and open to the public. Candidates seeking the District 1 seat are Fredd “Glossie” Atkins, Frank DiCicco and Mike Moran; for District 3, state Sen. Nancy Detert; and for District 5, Richard C. Eaton and incumbent Charles Hines. Members of the public are welcome to attend a social at 6:30 p.m. that evening to meet the candidates prior to the forum, the release notes. “Using atypical question formats and timing, CONA makes an effort to provide its members and the public with a more thorough understanding of the positions of each candidate than usually achieved at candidate forums,” the release says. “A lively format allows for the coverage of many issues,” it adds, noting that the public may submit questions for the candidates to discuss after the formal questioning concludes, if time permits. “This will be our last forum before the primary election in August because we and many of our members take vacations in the summer,” the release continues. Monthly meetings will resume in the fall, featuring forums on Sept. 12 and Oct. 10, the release adds. Since videos of all the meetings “are posted quickly” to CONA’s website and archived, all of the 2016 candidate forums will be available for viewing through the election in November, the release points out. The nonprofit organization meets at the Sarasota Garden Club, located at 1131 Boulevard of the Arts in Sarasota, which is at the intersection of Tamiami Trail and U.S. 41, south of the Municipal Auditorium. Parking and the entrance are reached from Van Wezel Way.